Canberra Greyhounds Vow To Fight On | Last Cup Run And Won? Champion Model with connections after winning the Listed Canberra Cup. PIC: Canberra Greyhound Racing Club Facebook. THE Canberra Greyhound Racing Club is adamant Sunday night’s Listed Canberra Cup (530m), the 38th running of the race, will not be the last. The race was taken out by Jodie Lord’s Champion Model (High Earner x Clay Model May ’15) which was quick to begin off box one, leading virtually all the way to score in a fast 30.25. SA chaser Hukanui (Kelsos Fusileer x Daddy’s Muffin Feb ’14) grabbed second ahead of Bombshell Bandit (Collision x J’s Robin Jul ’15) – a kennelmate to the winner. Kel Watt, a spokesperson for the Canberra Club, said the successful meeting was just what the local industry needed as it is faced with being banned by the local government from next July. “There is a sense of resilience and confidence that we can win the fight, but it is draining,” he said. “People remember how tough the fight was in NSW for survival, but with all due respect that fight lasted three months and we are now well over a year into our fight. “It’s taken an emotional toll on people – whether you are a staff member at risk of losing your job or a trainer at risk of losing your livelihood – it does wear you down. 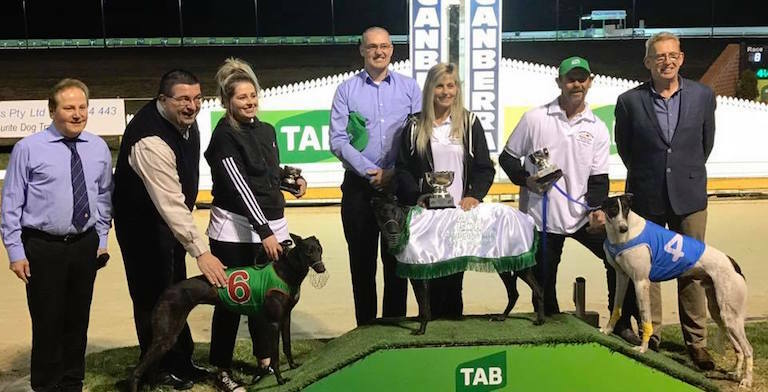 The Canberra track is the only one in the ACT, with the local government first announcing its intention to ban the sport following former NSW Premier Mike Baird’s contentious greyhound racing ban last July. While political, public and media pressure caused Baird to backflip on his ban in October 2016, the ACT government has remained steadfast in its intention to outlaw greyhound racing. Since last July, 15 policy changes have been introduced in an attempt to shut down the industry, which started with the government planning to suffocate the sport by axing all funding. However, the government has now ramped its plan up several notches, with legislation expected to be introduced into parliament at the end of September or early October to make greyhound racing illegal. Watt says the club is ready to fight, labelling the ban “unconstitutional” as they plan to challenge the validity of the legislation in court. “We are fighting to protect the sport nationally,” he said. “Whilst the ACT may be seen as the smallest state, if we were to fall over it means our opponents will then have the ammunition to target the other states. The club appears to have all bases covered, planning to get an injunction put into place while the court case goes ahead which would hopefully result in greyhound racing being able to operate out of Canberra until the case was decided. If not, Canberra has received permission from the Goulburn greyhound track to use their site as a temporary venue. Worst case scenario, if the ban does go ahead, the NSW government has already pledged to assist the local industry by building a new track just outside of the ACT border at Queanbeyan. Watt said the least the ACT Government could do is provide sufficient funding as part of a transitional package, which the club estimates to be a vastly higher figure than the $1 million already proposed. “We estimate that fair compensation would need to be between $20 and $30 million,” Watt said. “If your property is taken away by the government you have to be compensated fairly. We still have 10 years on our lease, all of our infrastructure, race fields income, people have jobs – all of these things are being taken away. “The government is being particularly mean about providing compensation. They have excluded people living in NSW who are going to be affected. “The NSW border is only five minutes away from the track, so we have staff members and participants who live 10 minutes away from the track and the government isn’t proposing to provide any support for them. ARG is there an update on Canberra closure? No news on the Canberra club page. They’re running out of time down there.